I’ve always been a fan of Super Bowl parties. Not because I care too much about football, I’m really not a huge fan although live games are fun to go to. No, I like the Super Bowl because it’s an excuse to get together with a bunch of friends in the middle of winter, get cozy on the couch and eat a few snacks. The Super Bowl is sort of like the New Years Eve of February, and I am always for a good party. This year, I went overboard (really this shouldn’t surprise anyone) on the snacks. 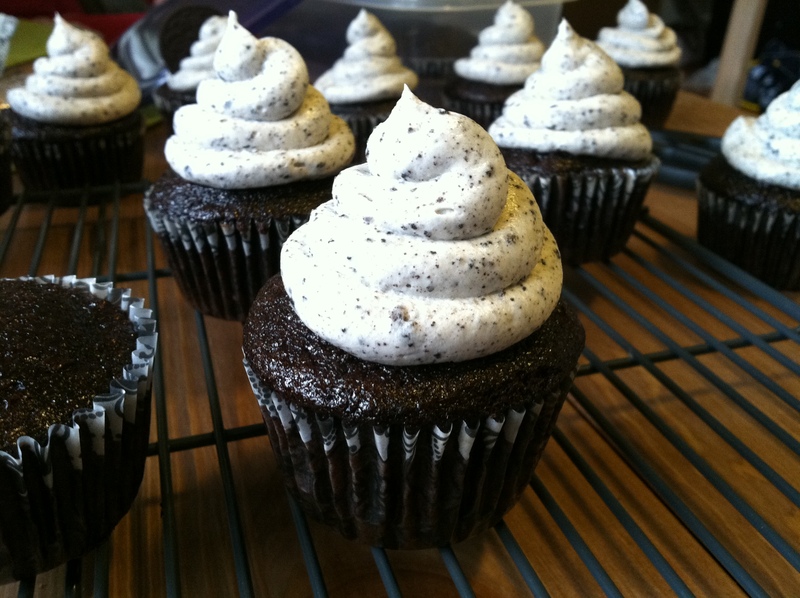 I just had too many recipes I wanted to try, and creating a cupcake that tasted like an Oreo was one of them. These are some tasty cupcakes. The cake itself isn’t too sweet, a darker chocolate, like the cookie on an Oreo, but the frosting is a sinfully sweet topping I will have to find more uses for. These flew off the food table at the party, and were a breeze to make. If you’re in a pinch for a bake sale, or last minute potluck, whip up a batch of these babies and everyone will think you worked far harder than you did. 1. 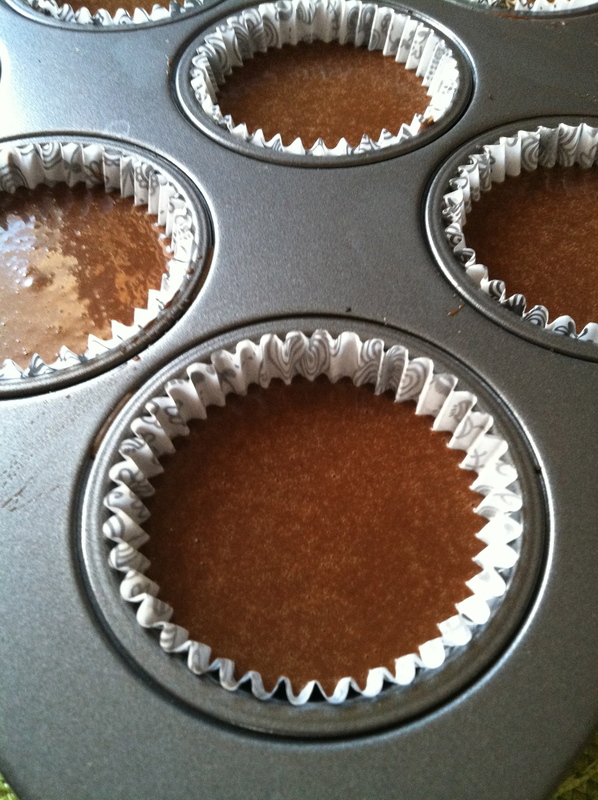 Preheat your oven to 350° F. Line your cupcake pans with paper liners. Gently twist 24 Oreos so the top cookie comes off, and all the cream stays on one side. Place the side with the cream in the bottom of each cupcake liner, cookie-side down. Save the other side for garnishing later. 2. Mix together the flour, sugar, cocoa powder, salt and baking soda in a large bowl, and mix until well combined. 3. Add the wet ingredients to the flour mixture one at a time, starting with the hot coffee and ending with the egg. This allows the coffee to cool a bit before you add the egg and ensures you don’t accidentally start to cook it. 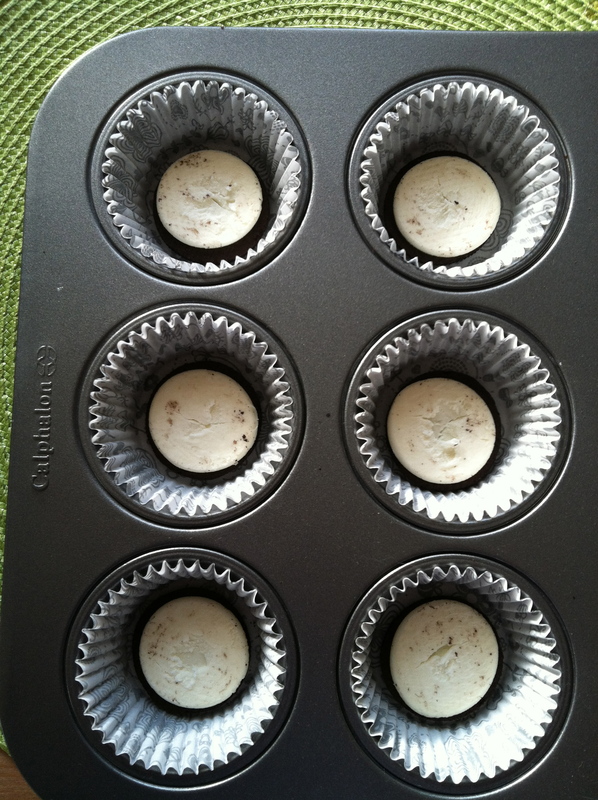 Pour the batter into the prepared cupcake pan. 4. 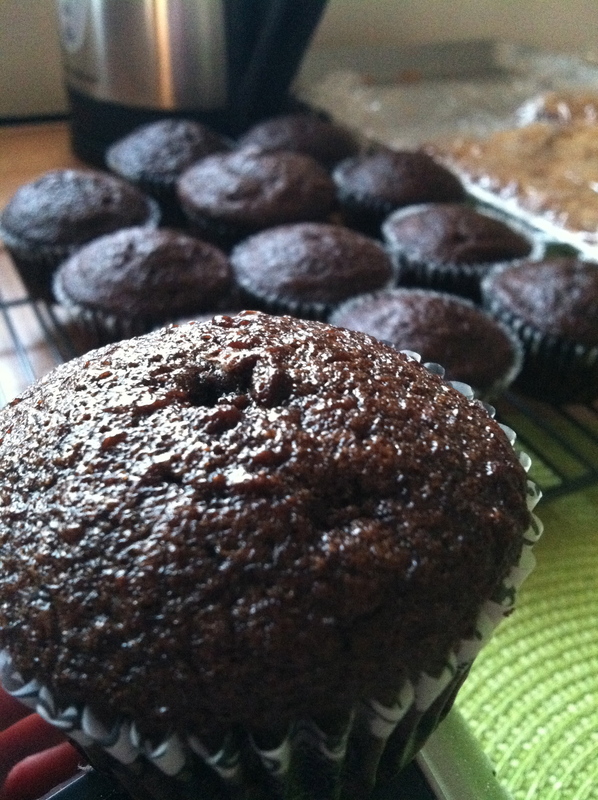 Bake for 16-18 minutes, or until a toothpick inserted into the middle of a cupcake comes out clean. Set them out to cool on a wire cooling rack. 5. While you wait for the cupcakes to reach room temperature, beat together the cream cheese and butter in medium mixing bowl. Add the powdered sugar 1/2 cup at a time to avoid powdered sugar explosions. I learned that the hard way. 6. Crush the remaining whole oreos (not the halves you reserved earlier) in a food processor until they’re down to crumbs. Mix them into the frosting for a lovely cookies n’ cream effect. 7. 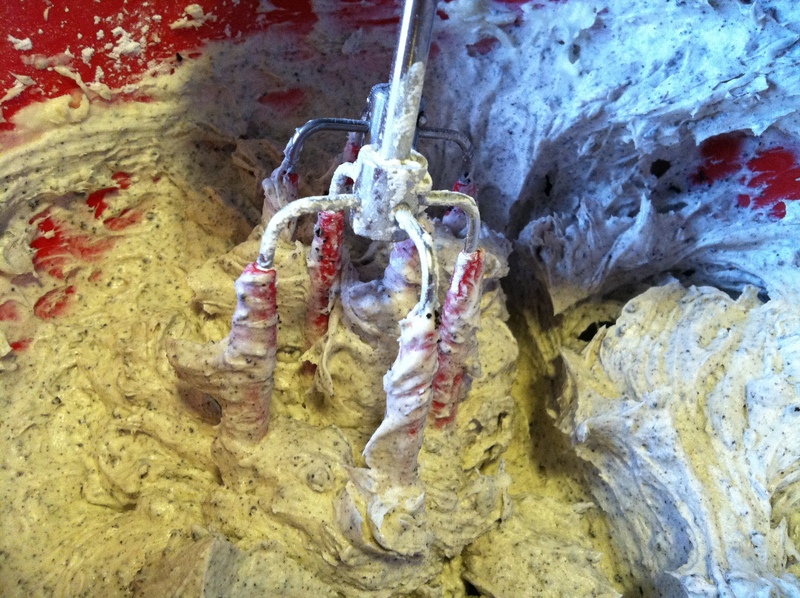 Using a piping bag, or a gallon-sized bag with the tip cut off, pipe the frosting in a tall swirl on top of your cupcakes. 8. 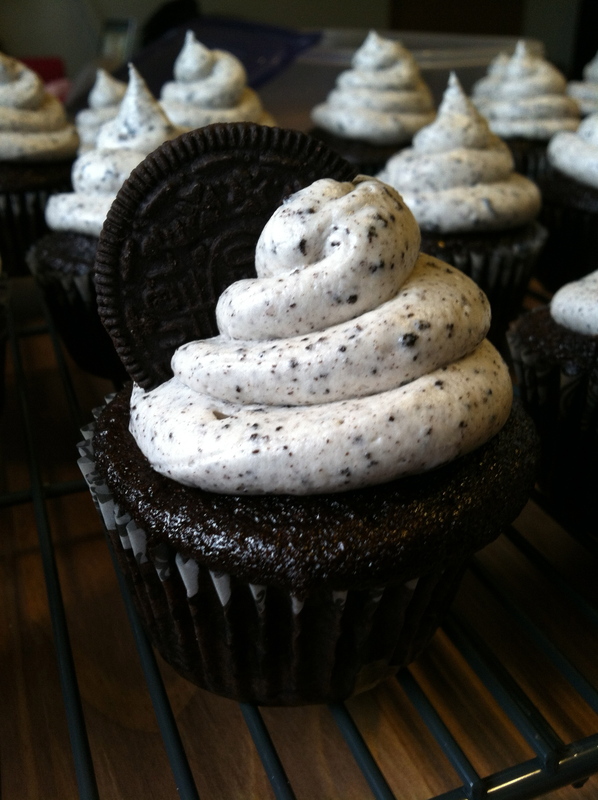 Break the reserved cream-less Oreo halves in half, and set one half on the side of each cupcake to decorate. Now all that remains is to see how long you can resist the lovely aroma before sneaking one for yourself! This entry was posted in Uncategorized and tagged Chocolate, Cupcakes, Desserts, Oreos, Party Food, Potlucks by theculinarycapers. Bookmark the permalink. is it 1tbsp or 1tsp? because 1 tbsp seems like a lot! It is indeed 1 tbsp. It sounds like a lot, but the recipe works! So excited to make these today! Love Oreos! Just finished making these in good ol high altitude Denver, Colorado and lets just say I won’t be making them again. They all collapsed and were nearly hollow in the center. Added more batter to the baking cups for the next 12 but I don’t have high hopes. Flavor is great, but the recipe does not work well at all in high altitude. Thanks for letting me know about the high altitude. I haven’t had the opportunity to test them any where other than in MN, so it’s good to know I should not recommend these to my high-altitude friends!